Take away neck and giblets and fill the cavity with shallot, apples and herbs. Mix chopped parsley, thyme, oil, pepper, salt and sage and brush the composition all over the turkey. Heat up the oven to 475°F and fry the bird approximately 45 minutes till the skin is golden brown. Take out the turkey, cover the breast with the double layer of foil and keep frying for 1 ½ hours more at the temperature of 350°F. 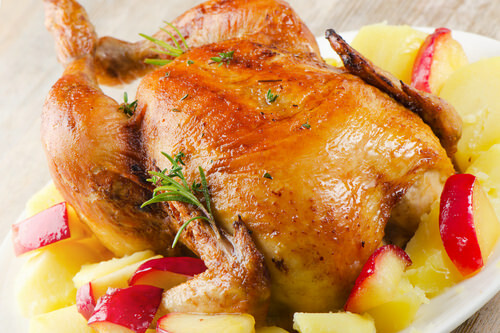 Lean the bird to allow juices to flow out of the cavity into the pan and add 1 cup of water, if the pan dries out. Put the turkey to a serving dish (keep shallots and pan juices). Serve with cider gravy.